Dr. Lawrence G. Miller III grew up in the Richmond, Virginia area. After graduating from Washington and Lee University with a Bachelor of Science in commerce, he began the pursuit of a career in medicine. He continued his studies in the Department of Microbiology at the University of Virginia and received his Doctoral Degree from the Medical College of Virginia (now Virginia Commonwealth University), where he also completed his OB/GYN residency. Dr. Miller is Board Certified with the American Board of OB/GYN and also did post-doctoral training with the Institute of Functional Medicine. He has advanced laparoscopic training in laser technology and is a Da Vinci Robotic surgeon. 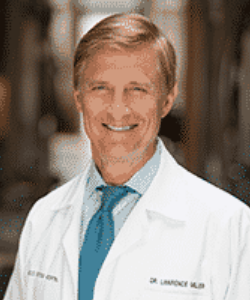 Initially joining one of Richmond’s premier group practices, Dr. Miller soon established his solo practice, which quickly grew to prominence specializing in Obstetrics, Gynecology, Infertility, Preconception, Functional Medicine, Gynecological Surgery, minimally invasive surgery and Robotic surgery. Primarily affiliated with HCA Henrico Doctors’ Hospital, where he served as a Board member, Dr. Miller is also on staff at Bon Secours St. Mary’s Hospital and the Parham Outpatient Surgery Center, where he also serves as the Chairman of the Medical Executive Committee. Combining the best of traditional medicine, the technology of modern medicine with preventative knowledge and skills, Dr. Miller is committed to partnering with his patients to keep them optimally healthy through all phases of their life, from the adolescent years to childbearing, menopause and beyond. Dr. Miller enjoys volunteering his services with the Access Now Healthcare Program located at the Fan Free Clinic. Dr. Miller is married, has four children and resides in Richmond, Virginia.